Enough with the sig campaign shitposts. And enough with the hostility. Since the Atlantis release on June 23, DERO's price is down >40% while network hashrate has plummeted by >90%, and all because of self-inflicted wounds. Not surprising given that the DERO team made some boneheaded moves during a brutal bear market for crypto as a whole. I'd say there are some valuable lessons to be learned from all of this, except there aren't: if you need an example of why it is bad to lie to your community then you are a sociopath and beyond being helped in the first place. There were 4 users posting with signatures for the same coin in short succession. Had literally nothing to do with anything you're talking about, Magic. I was just tired of seeing their posts. If anything your response was far more hostile than me complaining about posts. When source code and team info? This is an update from the Dero Project team dated July.9/2018. There has been a lot going on with the Dero Project, and we’re very excited to share with you some of what we’ve been up to these last few weeks. There has been a new Dero mainnet upgrade that brings new cutting edge technology to the blockchain, we’ve made great progress starting the Dero Foundation, the Dero GUI wallet is coming, and perhaps as important as anything, the Dero project team have reviewed our methods of communicating with the community. As many of you already know in detail, and for those who may not, the Dero Project recently upgraded our network to a new mainnet (codenamed: Atlantis). The Dero team are pleased to announce that this upgrade brings dramatically improved security, scalability, reliability, speed, and several firsts in the field of blockchain technology. Thanks to our exceptionally supportive community, and the hard work of our developers, we were able to thoroughly stress test, and debug our new blockchain technology across multiple private and public testnets. During our testing we were able to effectively push our new blockchain technology up to 75 transactions per second (75 TPS) while utilizing the full feature set (including privacy) of the CryptoNote protocol. One of the two key ways we accomplished a 20,000% (200x) scalability increase over the current implementations of the CryptoNote core was through the use of a new cutting edge blockchain technology that we named “Dero-DAG”. The second key improvement was to the core cryptography itself from the CryptoNote protocol. Dero’s core CryptoNote cryptography runs ~8x faster than the original core, and our bulletproof implementation is operating ~3x faster than the originally proposed version of bulletproofs. Dero-DAG is a linear proof-of-work based directed acyclic graph (DAG) that brings several very large improvements to current existing blockchain technology. One of the most notable areas of improvement, and one that we never lose focus on, is security. For example, Dero-DAG is (to the best of our knowledge) the only completely decentralized blockchain with true double spend immunity. This key technology has allowed Dero to turn many disadvantages on other networks (like soft forks) into strengths as they now provide additional security to Dero. Some people say a day in the real world is equivalent to a year in the world of blockchain. Given the massive influx of brilliant minds into this field, the point of blockchain technology in its adoption cycle, and our first wave of substantial regulations of the field, it’s not unreasonable to say that things feel as though they move almost as rapidly as the hyperbole from the first line in this paragraph would suggest. With the extensive amount of effort our research and development team have put into our new cutting edge blockchain technology it’s like we have our own small version of “a day in the real world is equivalent to a year in the world of Dero”. As such, it can be very difficult to discern what information to provide to the community, and when. We spent the time to review all of our communication history from day 1, and identified a number of areas where we can and will improve. The entire Dero Project team understands the importance of excellent communication, transparency, and positive community relations. We would like to offer our collective apologies for not realizing recently the scale of our communication issues. It would be reasonable to state that the Dero Project tends to learn from any bugs in the system, and this is no exception. Any communication issues that you may see will be addressed with the same seriousness we would approach other critical problems with. Moving forward our team will be taking the initiative to reach out to the community to provide significantly more information about the project, development, and we’re going to make our developers generally more available. Having said that, the community is able to start looking forward to Dero developer AMA (ask me anything) style conversations that we will try to schedule somewhat regularly. This should provide the community with a regular, and ongoing opportunity to have their concerns addressed by the team. We also plan to document and post all of the AMA conversations for people to review at their convenience. As a project with long term goals, the Dero team have initiated the process of forming a foundation that will oversee the governance, and development of the Dero Project. We anticipate that the Dero Foundation will be formed in approximately one month, and with the foundation we can expect to see a Dero developer reveal. The details surrounding the Dero Foundation will be released in a future update. Currently Dero has three (3) full time developers, of which two (2), including the Dero lead developer, will be revealing their identities with the launch of the Dero Foundation. The Dero Atlantis source code release will happen essentially in conjunction with the launch of the Dero Foundation, and we have already released the Dero core cryptography for audit. When we have more details regarding the audit of Dero’s core cryptography we will inform the community without delay. Looking towards Dero’s Q3/2018 goals for a moment, we can see the following are listed: GUI wallets, subaddress support, atomic swap, smart contracts testing. 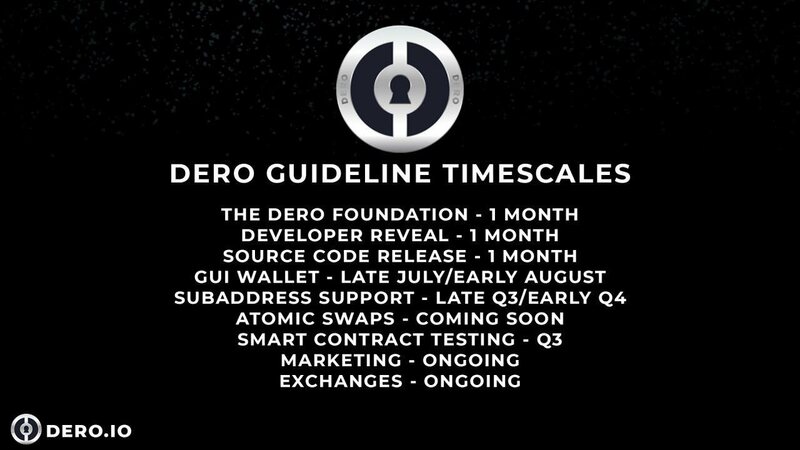 We’re pleased to announce that the Dero GUI wallets should be available by early August, or more likely late July. Additionally, we’ve heavily upgraded subaddress support to shadow address support which we anticipate will be available in Q3/2018 or early Q4/2018. The Dero research and development team are not taking Atomic Swaps off the table. We are however taking some time to review a technology that may prove to be superior that serves the same purpose. When we have more details in this area we will promptly update the community. Which brings us to smart contract testing. At the time of this update the Dero Virtual Machine, and smart contract testing are still on schedule for Q3/2018. After the first iteration of the Dero GUI wallets are completed we expect to be able to start providing the community with updates related to Dero smart contract and DVM development. With the advent of Dero’s minimum viable product (Atlantis) we feel that it’s an appropriate time to start pursuing marketing, and showcasing Dero’s technology to the world. With that being said, we can’t provide any further details until we finalize everything, but we can say with certainty that it will be a formidable effort. For more information about the Dero Project, or to speak with the team, please feel free to contact us at any of the following. Hello everyone, I'm very excited to announce that DERO's first official AMA will be hosted in our official Slack channel on Thursday at 4:30am UTC (July.12/2018 @ 4:30am UTC)! If you're interested in joining us, please try to make your questions concise so that we can answer as many people as possible. We are going to keep a record of our AMAs for everyone to read because we know not everyone can all commit to the same schedules. If you PM Serena with your questions I will do my best to add them to the list of things to ask during the AMA. We will be hosting the AMA on Reddit at the same time as originally planned instead of Slack! I beleive that you talking about priv signatures. Yes i have One as well. But if you read my posts and my activity in discord i give nothing but support to dero. I love the dero project, i already buy some coins, i dont care if the price its low now. I believe in long term and not dump coins. My only wish is to have more Money to buy dero. In some terms i am an noobie, but on another i believe i choose well the projects to follow. DERO its One off them. Please This is no atack to you, only to explain. The price of the Dero coin has caused many miners to leave. After all, the market is in a downturn. This coin has always surprised that, with the fall of the entire market, it has always been on the rise in price. Unfortunately now, when the market is recovering, this coin falls in price lower and lower. I'm beginning to worry, since my investment amount has decreased 3 times. I'm thinking about buying additional coins, but I'm afraid that the price will fall even lower. Is there a reason to fall in price? trying to understand what is going on here. No worries, I didn't mean to offend anyone either. It was more about users that were posting 1 word responses or not adding to the conversation with their responses. That, to me, looks like people just posting for a signature campaign. You know that this tech is literally the best of its kind around, you know what the potential is for Dero, even if they disappointed you with they way they handled things, and it's not like I wasn't disappointed, but I can easily look past it because I use many things and support many things in life that I don't necessary get along with or agree on everything with the people who made it.. At the end of the day, the tech wins, even if you're currently upset about it and some of the earlier supporters are too, the tech and subsequent success will move on with or without you. I think people are making way too big of a deal about this because in reality it doesn't change their lives in any way, and Dero is still the best tech around, and was never meant to be some community coin that the community makes all the decision on. 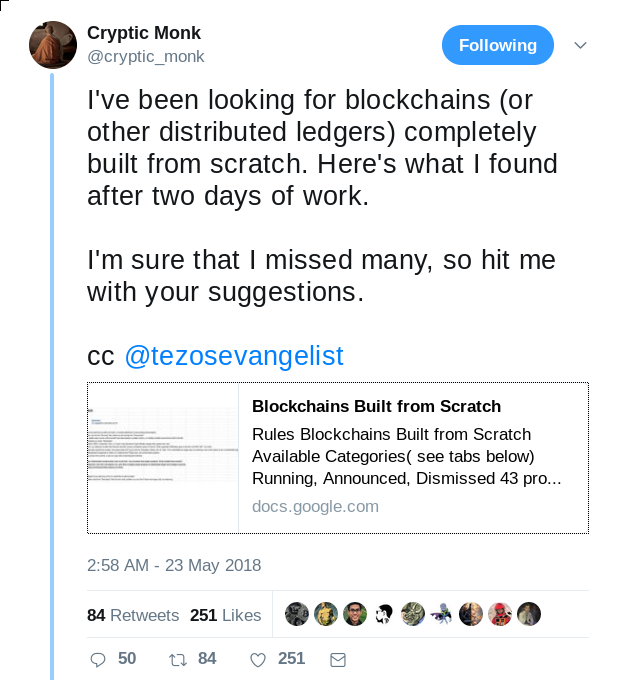 Actually, I don't know how good DERO's tech is because the source code hasn't been released, there haven't been any public comments from the "experienced" cryptographers that were asked to evaluate it, nor have there been any updates to the (closed source) binaries since June 29 (implying no one found even a minor bug in the code after weeks of feverish work and a testnet that saw updates being released on an hourly basis at times). Sorry, I guess I misread your motives as well. Fighting spam is always a worthy cause. Since the time the DERO Project started weʼve had the opportunity to grow in many wonderful ways that have helped us bring some of the best technology available to the blockchain. We feel itʼs time to grow in another extremely valuable way by helping with the formation of & “DERO Community Advisory Board” (DCAB). The purpose of this board would be to advise the DERO team on behalf of the collective community, oversee DERO Project development and the community in & manner seen fit for DERO by the community. All long term DERO supporters and DERO technology believers, pls drop a mail on [support ATT dero.io]. There are two options to check out how good is DERO's tech. 1] First Dont wait for others , start DYOR, Go through the already released source code https://github.com/deroproject/derosuite , let me know if you are capable to figure out something good. Pls feel free if you still have any doubts. If they do one word posts for signature campaigns they are probably losing their time, since sig campaign's posts need some content to be valid. If you were referring to my post where I was replying to the "do you own a shitcoin" funny post, it took me 10 minutes to make that post, that's not usually what you0d do for spam. I thought it was funny, if it wasn't, sorry. I'm here because DERO seems to be one of the really cool new coins around, with some new tech finally vs all the cut and paste coins. The last commit was in April 12th. I think he's talking about all the big changes made in the last months in Atlantis. Even if you remove the DAG, it is a port of cryptonote in Go, not a fork. Welp, it appears that --Serena-- has abruptly left the DERO team with no public explanation given. File under: the beatings will continue until morale improves.